It always makes us sad to hear that one of the SAFE alumni is looking for a new home. While it’s our intention that every adoption will last forever, we understand that situations change and sometimes horses have to be rehomed. We do ask that our adopters take responsibility for finding an acceptable new home with someone willing to sign and honor SAFE’s adoption contract, and most adopters are willing and able to comply with those terms. As you’ll hear us say time and time again, a well trained horse has the best chance of finding and keeping a good home, so when we get word that an adopted SAFE horse is being rehomed while exhibiting problem behavior under saddle…that’s a situation that makes us more than a little uncomfortable. 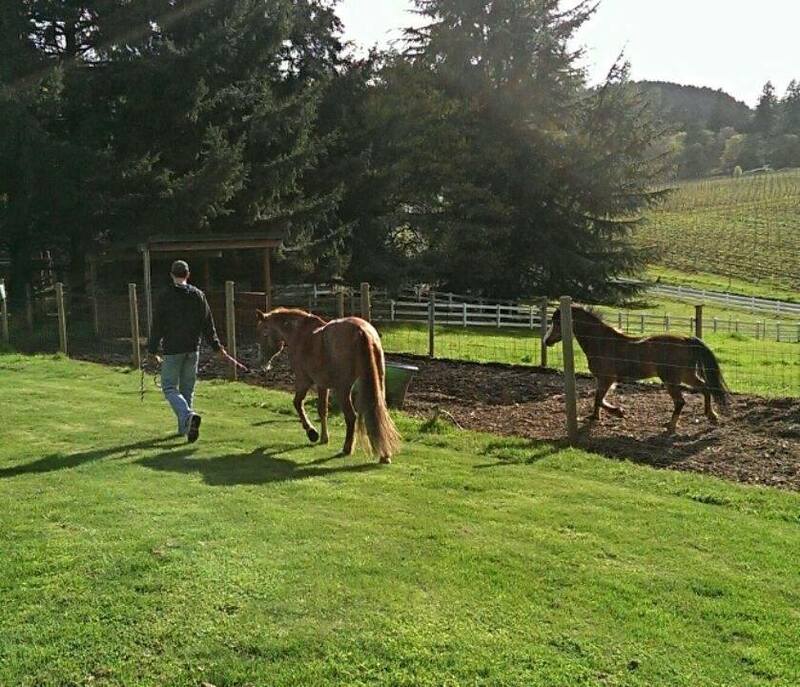 Such was the case with Maggie, our dear little redheaded Mustang pony who was adopted by a young girl in the Fall of 2013. What at first seemed like a match made in heaven had started to go south. Initially Maggie was getting weekly “tune up” rides from her trainer, keeping her at her best behavior for her young friend. 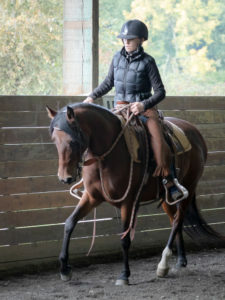 But when that training situation changed, the young rider became Maggie’s sole trainer, and problems began to creep in. 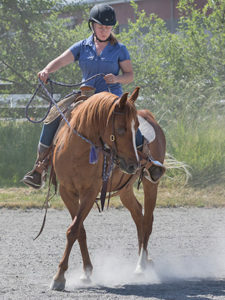 Maggie lost confidence and developed some bad habits like spooking and refusing jumps, which in turn made her rider lose confidence in her horse. When SAFE was called in to help, the girl was afraid to ride her pony, her new trainer had deemed Maggie unsuitable, and her parents were looking to rehome her. 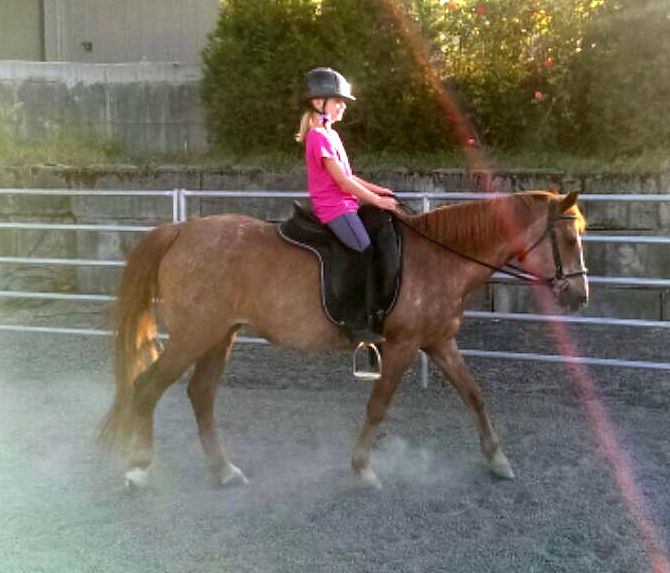 SAFE opted instead to bring Maggie back into our training program to get her back to the superstar pony she was when she was adopted and take responsibility for finding her a new adopter when she was ready. Maggie’s second chance came from a family living just outside of Portland Oregon. Megan and Josh were looking for a pony that their daughter Isabel could grow into. 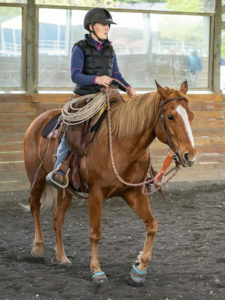 Terry spoke extensively on the phone with Megan, explaining Maggie’s sensitive nature, and happily she realized that this was a “horse family” that could work with Maggie and provide the thoughtful and patient training she needs to be successful. When they drove up to Woodinville to meet her, it was clear that they understood her and were more than willing to give her what she would need. “Maggie is doing well. 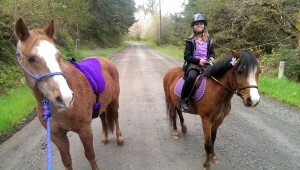 She and Tucker (their other pony) are quite bonded now. They share everything, including hay and grain! Which means Tucker is getting a bit fat, but he and my daughter just started lessons, so he’ll be getting more exercise now. Maggie loves to watch our comings and goings with interest. She nickers at me now when she sees me. “Maggie update: the petite princess is settling in well. She is the boss of Tucker and that seems to suit the two of them just fine. Maggie watches our coming and going with great interest. I have been spending lots of time just grooming her and working on further desensitization. Today she actually approached me when I gabbed the halter — a first. She was really relaxed during our grooming session and lifted each hind foot for me before I even asked for them. “Wanted to let you know that we are ready to make Maggie’s adoption official. 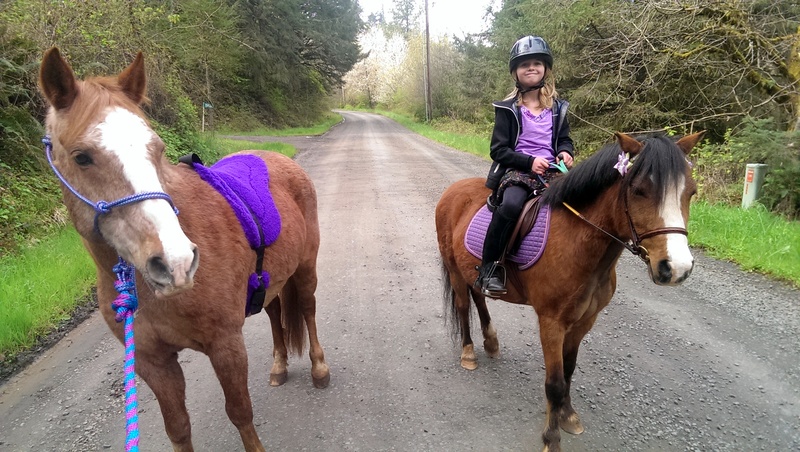 This weekend we took both ponies to the state park near us for our first off site trail ride. Maggie was completely awesome. She took everything in stride and was really good on the trails. She was more comfortable following Isabel on Tucker, but she also lead when I asked her to. Josh went with us and rode his mountain bike. By the end of the ride, Maggie was perfectly fine with him riding behind her, in front of her and even right next to her! She really is one smart little mare. I feel like she and I have really turned a corner in our trust. She really seems happy here and nickers to me whenever I come outside. All Maggie needed was a confident leader to firmly, yet fairly, give her life structure. She’s so sweet and we all enjoy her very much. We are so pleased that Maggie has found a wonderful family to be a part of, and so grateful to them for treating her with the patience and kindness she deserves. Thank you for giving Maggie her second chance, and happy, happy trails!! Congratulations Isabelle, Megan, Josh, and Maggie!